Iniencephaly is a rare birth defect having retroflexion of the head combined with severe distortion of the spine. Based on the presence or absence of encephalocele, Lewis  has classified iniencephaly into two groups - iniencephaly apertus and iniencephaly clausus. Cardiovascular disorders, diaphragmatic hernias, and gastrointestinal malformations are other additional defects seen in these cases. Most of iniencephalic babies are still born or die soon after birth; however the milder forms of iniencephaly cases are not fatal. Here we present a rare case of iniencephaly clausus with review of literature. A 25-year-old primi visited obstetric out-patient department with complaints of abdomen and back pain. She had neither antenatal check-up nor had taken folic acid supplementation previously. 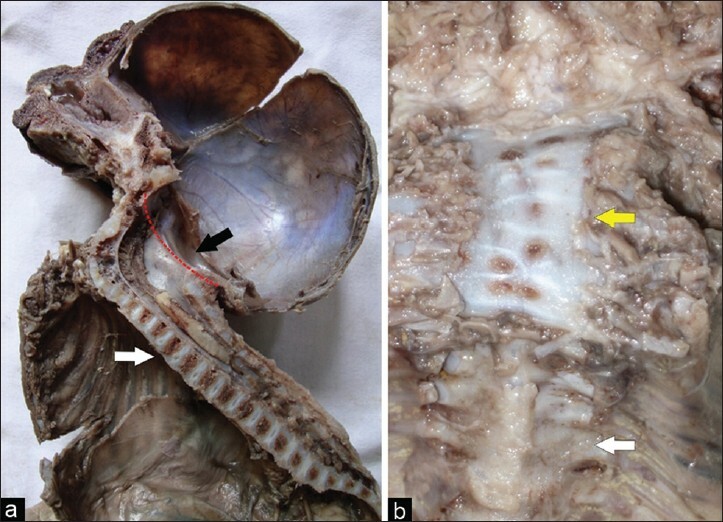 On abdominal ultrasound, a single-live fetus with hyperextension of cervical spine was found. No other abnormalities were detected on USG except for polyhydramnios. She spontaneously delivered a female baby at 29-week gestation who died 10 minutes after delivery. 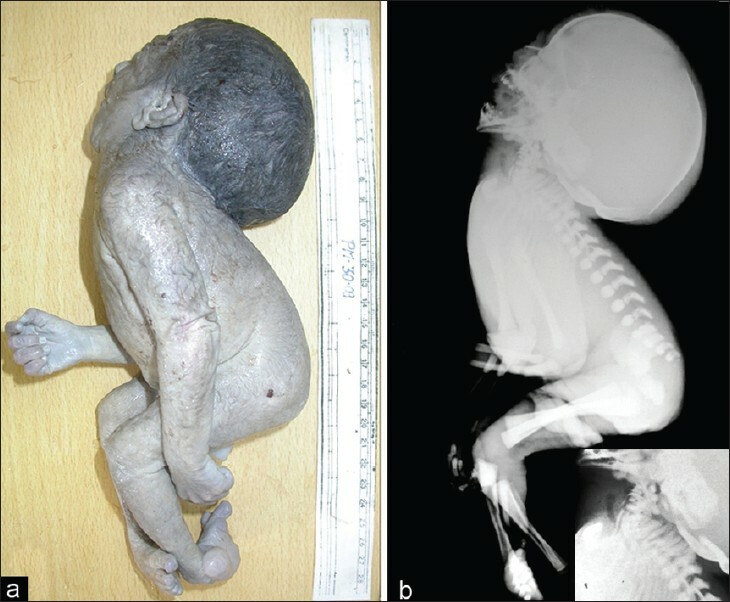 On autopsy fetus weighed 900 g and showed severe retroflexion of enlarged head (28 cm in circumference, normal is 24.96 cm at 28 weeks and 28.59 cm at 32 weeks of gestation), short spine and neck with mandibular skin touching the chest, micrognathia, low set ears, and bilateral clubfoot [Figure 1]a. Radiograph of the necropsy was done which revealed hyperextension of the neck with occiput touching the cervicodorsal vertebrae with soft tissue continuation on the dorsal aspect of neck. There was a wide gap in the occiput. Cervical and upper thoracic vertebrae showed block vertebrae suggestive of iniencephaly [Figure 1]b. Necropsy of the fetus showed hypoplastic lungs weighing 18 g, small posterior fossa with hypoplastic cerebellum (weight <10 g), widened foramen magnum with anteroposterior (AP) diameter of 3.5 cm, and fusion of cervical and upper four thoracic vertebral bodies anteriorly with crowding of the arches and spinous processes posteriorly [Figure 2]a and b. Cerebrum and spinal cord were normal in development. All other organ systems were normal. Umbilical cord showed single artery and microscopic examination of all organs was normal. Iniencephaly is an uncommon neural tube defect (NTD). Incidence ranges from 0.1 to 10 in 10,000. It is more common in female babies. The word Inien is derived from the Greek word "Inion" which means nape of the neck. Here inion (posterior most part of occipital bone) fuses with the back leading to the absence of the neck and retroflexion of head. The exact etiology and pathogenesis is not known, both genetic and environmental causes have been implicated. Chromosomal abnormalities including trisomy 18, trisomy 13, and monosomy X have been associated with this disorder. Environmental causes like poor socioeconomic conditions, low parity, and lack of folic acid supplementation, obesity and drugs including sulphonamide, tetracycline, antihistamines, and antitumor agents are shown to have increased risk. In the present case poor nutrition and lack of folic acid supplementation during pregnancy may be the cause. Previous reports have mentioned about risk of NTDs in mothers having hyperhomocysteinemia. Folic acid lowers the raised homocystein levels and reduces the risk of NTDs. Occipital bone deficit leading to enlarged foramen magnum. Irregular fusion of malformed vertebrae. Incomplete closure of vertebral arches and bodies. Retroflexion of the cervical spine. Upward turned face with chin continuous with chest because of the absence of neck. Our case had all these features and hence was diagnosed as iniencephaly. Congenital retroflexion of spine is mainly seen in two groups of anomalies, one is anencephaly and other is iniencephaly. Iniencephaly apertus should be differentiated from anencephaly with retroflexion of spine. And iniencephaly clausus should be differentiated from Klippel-Fiel syndrome (KFS) and cervical meningomyelocele. Anencephaly shows a total or partial absence of neurocranium and retroflexed head is not covered with skin. However, in iniencephaly the retroflexed head is completely covered with skin. Cervical vertebrae are abnormal in iniencephaly and they are almost normal in anencephaly. In the present case the retroflexed head was completely covered with skin and there was no encephalocele. It is important to differentiate between iniencephaly clausus and KFS. KFS is caused by a failure of segmentation of the cervical vertebrae during early fetal development. Although fusion of cervical vertebrae and malformation may be present in both, retroflexion of head is usually not seen in KFS and the presence of retroflexed head should raise suspicion of iniencephaly. At times it is difficult or impossible to differentiate these two; however it is important to separate the two because KFS is not lethal and can be corrected surgically. Other entities that come in differential diagnosis are nuchal tumors such as teratoma, goiter, lymphangioma and Jarcho-Levin syndrome. In summary, iniencephaly is one of the uncommon NTD which causes obstructed labor and necessitates proper obstetric management. It also carries the risk of recurrence in next pregnancies (1-5%); hence the patient should be counseled and encouraged to take folic acid supplementation at least 3 months prior to conception. We present this case for its rarity and isolated iniencephaly without any other major malformations are not always fatal, and should be diagnosed antenatally because proper postnatal surgical therapy can be planned. 1. Pungavkar SA, Sainani NI, Karnik AS, Mohanty PH, Lawande MA, Patkar DP, et al. Antenatal diagnosis of iniencephaly: Sonographic and MR correlation: A case Report. Korean J Radiol 2004;8:351-5. 2. Chen CP. Prenatal diagnosis of iniencephaly. Taiwan J Obstet Gynecol 2007;46:199-207. 3. Semi T, Mehmet U, Oya P, Husamettin U, Cem C, Firat E. Iniencephaly: Prenatal diagnosis with postmortem findings. J Obstet Gybocol 2007;33:566-9. 4. Gadodia A, Gupta P, Sharma R, Kumar S, Gupta G. Antenatal sonography and MRI of iniencephaly apertus and clausus. Fetal Diagn ther 2010;27:178-80. 5. Katz VN, Arthur S, Aylsworth, Albright SG. Ininencephaly is not uniformly fatal. Prenat Diagn 1989;9:595-9. 6. Ayter MH, Dogulu F, Cemil B, Ergun E, Kurt G, Baykaner K. Iniencephaly and long-term survival: A rare case report. Childs Nerv Syst 2007;23:719-21. 7. Balci S, Aypar E, Altmok G, Boduroglu K, Beksae MS. Prenatal diagnosis in three cases of iniencephaly with unusual postmortem findings. Prenat Diagn 2001;21:558-62. Popli, M.B. and Popli, V.